Sometimes in summer it is just too hot to stand in a kitchen with the kettle boiling and the heat radiating. But when those coffee cravings hit what other option do you have… homemade cold press coffee! Ice coffees are extremely popular during summer and come in a variety of recipes. Some people prefer the crushed ice freezos, some people are all about coffee milkshakes, and others prefer a simple pour over coffee on to some ice. Whatever you fancy, homemade cold press coffee is a great way to drink good coffee at home during summer. So here is what you do. Decide on the coffee bean that you most prefer. We use a Guatemalan bean from Coffee Merchant that is a medium roast and full of rich flavour. Now you can just make your coffee using an aeropress and then pour it over ice and add some milk, but the method I’m about to share really extracts the flavours as it sits in a full immersion state. Grind your coffee beans and fill 1 cup with the coffee grind. Put the cup of coffee grind into a glass jar. Add 3.5 cups of PURE water (no tap water). We use aquelle bottled water. Stir for about 30 seconds, then close the jar and leave to sit on the kitchen counter for 12 – 16 hours. Sieve the cold coffee leaving behind the wet grind and keeping only the cold drinkable coffee. It is now ready to drink. You can keep it in a bottle in the fridge but preferably drink within a week. That wont be hard for coffee lovers. When pouring yourself a glass of homemade cold press coffee you can either drink it over ice, which offers a far stronger and punchy taste, or you can mix about 25ml of cold press coffee with a cup of milk (you can make it however strong or weak you like). So there it is! 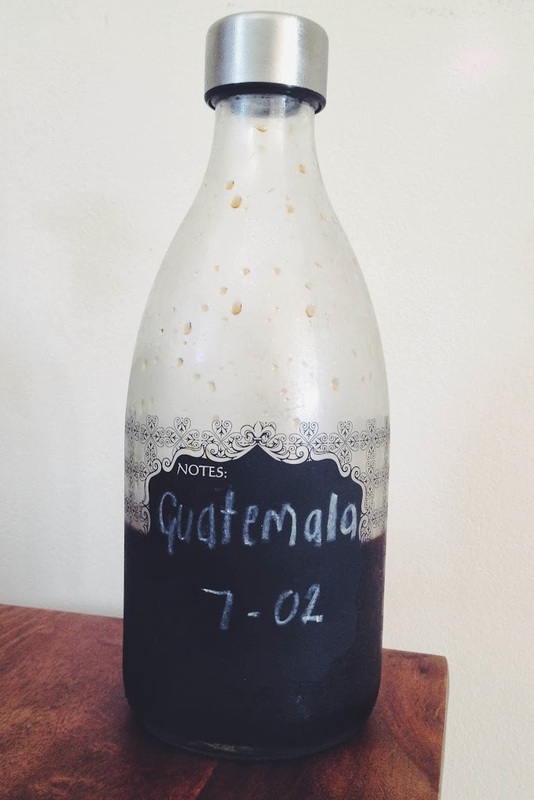 We have tried a few different beans and are really loving this homemade cold press coffee with the Guatemalan bean, but I would LOVE to hear which bean you most prefer and what method you use at home. This might seem complicated but it is a method used around the world to make great homemade cold press coffee, so I do hope you enjoy every sip.